1. 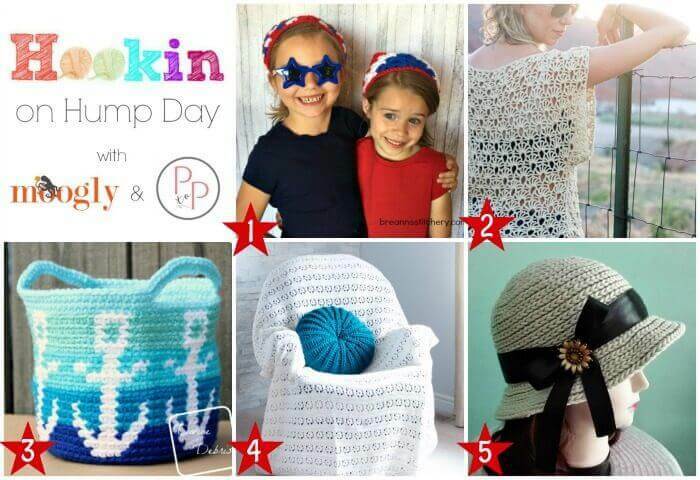 MOST CLICKED LINK: Patriotic Hair Bandanas from Hooked on Homemade Happiness – These adorable patriotic bandanas are quick and easy to make … FREE crochet pattern too! 2. Canyonlands Boho Crochet Top from Make & Do Crew – This lacy crochet top has a flowy boho vibe and a slightly cropped look … pattern includes sizes Small through 3XL. FREE crochet pattern and tutorial! 3. Anchors Away Basket from Devine Debris – This basket is perfect for adding a nautical theme to your decor or for stashing your summer essentials … FREE crochet pattern! 4. Sand Dollar Crochet Pillow Cover Pattern from Sustain My Craft Habit – Update your room with some of these pretty throw pillows … FREE crochet pattern! 5. Crochet Straw Sun Hat from Crochet for You – A stylish hat to shield you from the sun … FREE crochet pattern! That golden pouch caught my eye right away! Thank you for hosting the link up!